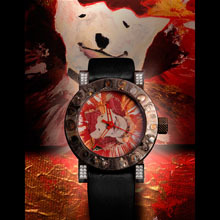 “Oh, my dog!” A watch dial serves as the perfect canvas for the painted canine. ArtyA now mixes art with horology in a more direct way, offering specially selected popular artists the ability to expand a one-of-a-kind miniaturized watch dial into a full-scale painting. Oh My Dog has a friendly face on the watch face. 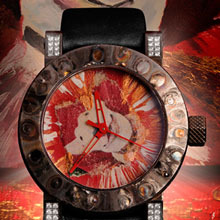 Artist Dominique Arpa-Cirpka was asked by a customer to reproduce a painting of a white pit bull on the dial of an ArtyA Coup de Foudre watch. Struck by lightning to produce an absolutely unique effect, this timepiece not only has a totally original dial, but a piece unique watch case to go with it. The lugs and the side of the steel case have been decorated with diamonds, while inside the timepiece is a Swiss automatic mechanical movement. ArtyA’s message of artful watch making is perfectly clear when a watch dial becomes a painting itself. This continuing tradition will reveal itself again with new partnerships between artist and watch maker in the creation of exclusively piece unique offerings.